There are many things in this world between which there are proportional relationships. Sometimes, this is a direct proportional relationship: the more you exercise, the fitter you get; the likelihood of the photocopier breaking is directly proprtional to the importance of the job you are copying; or you get what you pay for. Other relationships are inversely proprtional: the more unattainable somebody is, the more appealing they become; the flashier the sports car, the smaller the driver’s… erm… self-esteem (! ); or in the case of restaurants, the better the view the worse the food. But there is always the exception that proves the rule. Harbour House in Kalk Bay, Cape Town occupies an enviable position on the breakwater of Kalk Bay’s picturesque working fishing harbour. 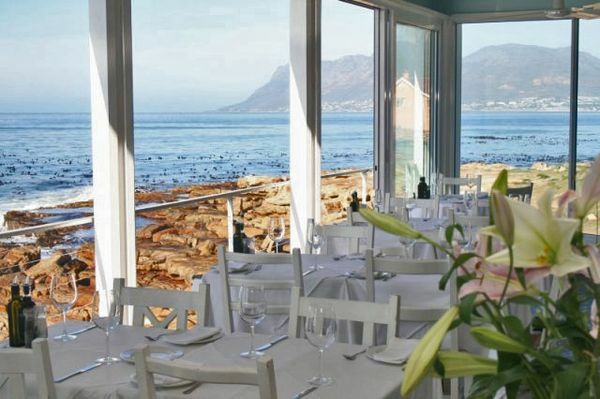 The restaurant’s floor to ceiling windows provide gorgeous views overlooking False Bay and the mountains beyond on one side, and the colourful harbour on the other. From late July, whales come into the bay to calf and are regularly visible to diners; while in winter a log fire roars in the centre of the restaurant as huge waves crash on the rocks below and spray splashes the windows. With this amount of eye candy on offer, you might suspect that the food takes a bit of a back seat. But you’d be wrong. I visited Harbour House on my last trip to Cape Town, in the charming company of Colleen and Jamie. Sadly, we went for dinner so I did not get to enjoy the fantastic views, but even after dark, the airy room with its sparkly chandeliers, decorated in pale neutrals provides an attractive backdrop to a meal. I had requested a table by the window when booking and was thrilled that they could oblige us. Even though we could not photograph the view, it was wodnerful to be able to see and hear the waves crashing on the rocks below as we ate. The menu is compact, the philisophy being that they would rather do a limited number of their classic dishes well than over-extend themselves or change the menu too often. The restaurant has its own fishing boat to ensure the freshest catch, which does mean that the line fish offering changes regularly though. The emphasis is on fish throughout but carnivores need not despair – there is at least one red meat option on both the starter and the main menu! I started with the tian of prawns: three sizeable prawns fried in tempura batter and served on an avocado, aubergine and tomato tian, with basil mayonnaise and sweet chilli jam. The tempura was as light as a feather and the prawns were complemented nicely by the chilli sauce. The choice of Mediterranean flavours in the tian was slightly surprising with the Asian-influenced prawns but worked well to offset the richness of the seafood. Other starters at out table included masala-dusted calamari served with rocket, spring onions and a green olive, anchovy and caper sauce tartare (delicious – really tender, sweet calamari given extra oomph by the masala); marinated seafood ceviche of fresh fish, prawns, calamari & mussels, dressed with a lime and coriander dressing (one of the best ceviches I’ve tasted – any fresher and the fish would still be swimming); and beef tataki – slices of rare seared fillet with red onions, coriander and a pickled mushroom salad (a wonderful combination of flavours and a nice change from the ubiquitous beef carpaccio). For my main course I could not resist the lure of the fresh linefish which I believe was geelbek that day. It was served on garlic mashed potatoes and fine green beans, topped with a poached egg (something I can seldom resist!). It’s hard not to use superlatives to describe the dish: the fish was properly seared on the outside and barely cooked within; the egg was runny-yolked perfection, and the flavours of the garlic mash and crunch of the sweet green beans were a wonderful foil for the fish. A simple but marvellous dish. Other mains included grilled sole on a creamy bed of spinach and mushrooms; and a small 3-bone rack of lamb with a fresh chive and mustard crust, served with mediterranean vegetables and a balsamic drizzle. I had a taste of Nick’s lamb that was so good, it momentarily made me regret having fish – the meat was perfectly pink inside and had the herby flavour that only good lamb can have. Highly recommended for carnivores. For dessert, I wanted something light so I went for the trio of sorbets, served on pineapple carpaccio with chilli lime syrup. The sorbets were light and pleasantly not sweet (I remember lemon and passion fruit but can’t for the life of me remember the third flavour! ), but the highlight of the dish for me was the pineapple and the tangy syrup which made for a perfect palate cleanser. I need to try and recreate this at home! Also on the dessert menu were such standards as creme brulée, panna cotta and baked cheesecake. Harbour House is stylish without being stiff or formal, and despite the setting which could so easily see a restaurant relying on the view rather than the food to draw customers, I found everything we ate to be outstanding with good fresh ingredients and innovative flavour combinations. Service was knowledgeable and friendly, and the entire evening was relaxing and lovely. There truly is something special about eating fish with the sound of the breakers in your ears, and I would not hesitate to return here, or recommend it to locals and visitors alike. At R250 – R300 per person for 3 courses with wine, it may not be cheap as chips but certainly represents good value. Also on the premises are Polana (a stylish cocktail lounge on the rocks), Live Bait (a more casual seafood venue below the main restaurant – actually on the breakwater) and Luckyfish & Chips (a new takeaway outlet with a “no frozen fish” policy, ensuring the freshest fish possible). In October 2011, Harbour House opened a second branch in the V&A Waterfront. Mmmmmm, on my visit to Kalk Bay I could afford eating at good ol’ Kalkies on the other side of the parking lot. The food looks very good and stunningly presented plus nothing beats a view like that. I would start with the Tian of Prawns too! Everything looks so delish.. Thank you for putting together this lovely series. ah! and i will be there in just three weeks! can’t wait! Harbour House Kalk Bay would not survive if it were not for tourists as locals find the prices a rip off! Live Bait sells shark under the name ‘Lemon fish’- misrepresentation! Polana allows smoking in the restaurant at the tables, or you can sit at the bar and blow your smoke at the diners – DISGUSTING . . . and illegal of course! Buy your meal at Kalkie’s and sit on the rocks – view is free! Oh how I miss Kalk Bay. We had dinner HHKB last year on our yearly visit to SA. Thanks Jeanne for your lovely blog and a reminder of lovely times spend in the Kalk Bay area. A gorgeopus view and lovely food! A perfect place to eat. Lovely post and what a view!